and treatment of a dermoid cyst. Pathology revealed a cyst wall lined by focally keratinizing stratified squamous epithelium with underlying areas focally showing skin adnexae. The globules identified on the imaging studies were composed of keratinaceous debris with acute inflammation. The postoperative course was rather eventful as the patient had submental swelling and drain output that exceeded the criteria for safe discharge. Drains remained in place for 3 days. Because of increasing swelling, his neck incision was reopened on postoperative day 5. Edema of muscle and soft tissue was present. The remainder of his recovery was uneventful. At follow-up 4 months later, he reported no problems with oral intake, articulation, or breathing. He no longer needed to sleep in a semi-recumbent position. He did not have asthma, and no longer required albuterol. DISCUSSION Image demonstrates a large, well-defined floor of mouth mass that is hypodense compared to adjacent musculature. Multiple low-attenuation, rounded foci are noted scattered throughout the lesion. Note slight mass effect upon the oropharyngeal airway (arrow). Image shows that the lesion is cystic, measures 13 x 8 x 5 cm, and contains multiple mobile, hyperechoic nodules (arrows) suspended within the fluid. soft tissue. Dense musculature was dissected off the mass and retracted away. Once the plane around the mass was established, dissection was completed from lateral to medial and inferior to superior. The right marginal branch of the facial nerve and submandibular gland were identified and preserved. Once the mass was circumferentially exposed, it was delivered out of the neck, freeing it from its depths on the left side. The tissue tethering the mass to the neck was cut and the mass was delivered intact. Final inspection, irrigation, hemostasis, and drain placement were completed prior to closure. Shows no appreciable enhancement within the cyst, localization of the mass to the sublingual space. Minimal enhancement is noted at the periphery (arrows). Globules are noted with arrows. tures that can aid in preoperative diagnosis. Although benign and often asymptomatic, dermoid cysts may cause other associated symptoms due to extrinsic compression of structures in the head and neck, including airway compromise. Currently, surgery is the mainstay of treatment and complete excision typically results in a very low recurrence rate.2,3 Funding/Support: None declared. Financial Disclosures: None declared. 3. 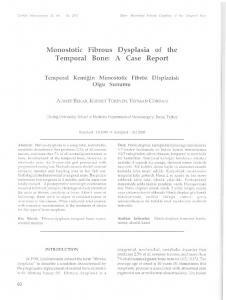 Longo F, Maremonti P, Mangone GM, De Maria G, Califano L. Midline (dermoid) cysts of the floor of the mouth: report of 16 cases and review of surgical techniques. Plast Reconstr Surg. 2003;112(6):1560–1565. 4. Al-Khabteeb TH, Al Aoubi F. Congenital neck masses: a descriptive retrospective study of 252 cases. J Oral and Maxillofac Surg. 2007;65(11): 2242-2247. 5. Connolly AA, MacKenzie K. Paediatric neck masses—a diagnostic dilemma. J Laryngol Otol. 1997;111(6):541-545. 6. Lin HW, Silver AL, Cunnane ME, Sadow PM, Kieff DA. Lateral dermoid cyst of the floor of mouth: unusual radiologic and pathologic findings. Auris Nasus Larynx. 2011;38(5):650-653. 7. Ayugi JW, Ogeng’o JA, Macharia IM. Pattern of congenital neck masses in a Kenyan paediatric population. Int J Pediatr Otorhinolaryngol. 2010;74(1):64-66. 1. King RC, Smith BR, Burk JL. Dermoid cyst in the floor of the mouth. Review of the literature and case reports. Oral Surg Oral Med Oral Pathol. 1994;78(5):567–576. 2. Meyer I. Dermoid cysts (dermoids) of the floor of the mouth. Oral Surg Oral Med Oral Pathol. 1955;8(11):1149–1164. The mission of WMJ is to provide a vehicle for professional communication and continuing education for Midwest physicians and other health professionals. WMJ (ISSN 1098-1861) is published by the Wisconsin Medical Society and is devoted to the interests of the medical profession and health care in the Midwest. The managing editor is responsible for overseeing the production, business operation and contents of the WMJ. The editorial board, chaired by the medical editor, solicits and peer reviews all scientific articles; it does not screen public health, socioeconomic, or organizational articles. Although letters to the editor are reviewed by the medical editor, all signed expressions of opinion belong to the author(s) for which neither WMJ nor the Wisconsin Medical Society take responsibility. WMJ is indexed in Index Medicus, Hospital Literature Index, and Cambridge Scientific Abstracts. Report "A Case of a Dermoid Cyst Compressing the Airway"